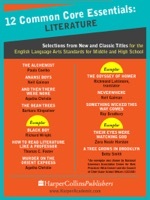 As you reevaluate the books you use in your classroom to meet the Common Core Standards, this free collection—filled with selections from classics such as Zora Neale Hurston's Their Eyes Were Watching God, contemporary novels like The Alchemist by Paulo Coelho, and the AP English favorite How to Read Literature Like a Professor by Thomas C. Foster—will help you decide which books are right for you and your students. Finally I get this ebook, thanks for all these 12 Common Core Essentials: Literature I can get now! 12 Common Core Essentials: Literature was the best books I ever buy. 12 Common Core Essentials: Literature did exactly what you said it does. I will recommend you to my colleagues. 12 Common Core Essentials: Literature is the most valuable books we have EVER purchased. I'd be lost without this. I am completely blown away.